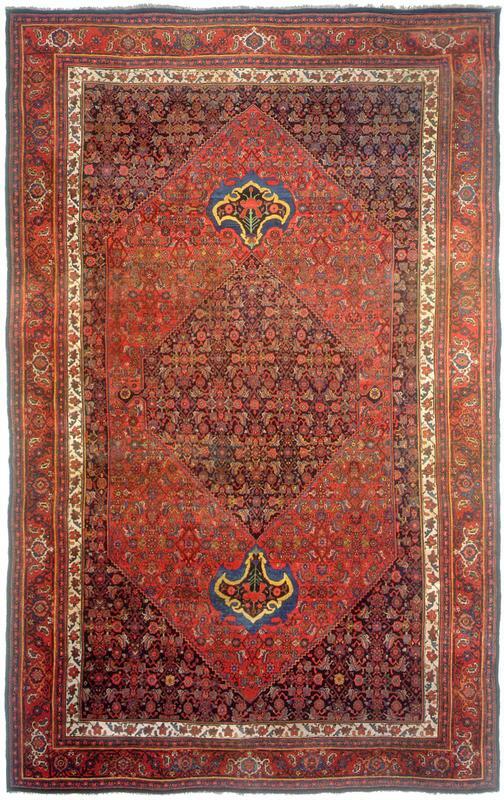 10' 5" x 17' 6"
Bidjar - 10' 5" x 17' 6"
This is a classic example of the large carpets produced in Bijar, northwest Iran. It shows the typical format of the tall, hexagonal medallion with elaborate floral terminals, set against the framing matrix of triangular cornerpieces. Bijars like this example display an adroit use of filler motifs, the so-called "Herati" pattern, which sprawl across the entire surface of the field - medallion, cornerpieces, and the ground alike. Yet through the use of soft color and design, these fillers manage not to overwhelm or crowd the rug. Instead they recede, allowing the red and blue ground colors to dominate, but with a rich, textured undercurrent of design. The red-ground borders function in much the same way, harmonizing with the field, while the white ground inner border serves to set of the field from its outer frame.